How do you build a rich world around what at first seems like a haphazardly put-together world? The answer, one patch update at a time. When League of Legends was first released in 2009, the background story of the game was shallow at best. Now, after several background redesigns and expansive lore building outside the game, Riot has set out to craft a rich world around the mundane. League has changed dramatically since launch. The game was released as a spiritual successor to Defense of the Ancients and brought over some of the same champion designs, including some absolutely absurd creations. 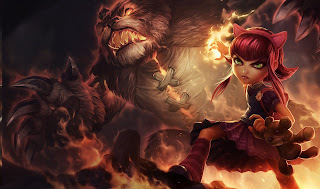 The original set of forty playable champions included a pyromaniac little girl, a minotaur, a scarecrow, and a little Yordle riding a yeti. Little bound these characters together other than some contrived story about the world of Runeterra settling their differences in the League of Legends. Since launch, the numbers of playable champions has ballooned to 114, with the upcoming Lucian marking the 115th champion in the league. While Riot added pieces to the game's narrative sporadically, the unique champions have kept coming. Newcomers have included a staff-wielding monkey-man, a woman with enormous steam-punk gauntlets, an armored polar bear, and many more. At quick glance, the selection of characters appear just as hodge-podge as ever. Regardless, the game lore has become increasingly expansive, even while the actual gameplay has changed very little. Several champion backgrounds, a few paragraph-length stories that explore a champions past, have been updated since launch, toning down the humor and adding darker or more expansive lore. Some characters, like Thresh and the upcoming Lucian, have backgrounds that tie together. In this case, Lucian's deceased wife had her soul taken by the lantern-wielding ghoul. In some cases, these lore do in fact have a presence on the battlefield. Riot launched the recently released Howling Abyss map with a blow-out event that re-wrote character lore, established a history for the new location, and included a website that split some champions into warring factions. If you play a certain character on the map, unique audio cues enrich the story. Likewise, if the characters of Ashe and Lissandra are on opposing teams, each team may be given a unique quest that is satisfied only if one of them kills the other. Again, functionally, none of this lore matters one bit. However, lore speculation and fanaticism over specific characters seems to have grown. If anything, Riot is merely adding narrative content to meet a player demand for not only an entertaining game, but a compelling back story that enriches each individual match. As far as I'm concerned, it's a remarkable success. I long for the rounds I can watch one character duke it out against another, and I do find myself reading into the characters I often play. For a game that never needed it, the effort Riot has put into the story is impressive. In fact, maybe it's even rich enough for the story to break out of the MOBAs and into other game genres entirely. Did you try Dota 2? Its launched today, i honestly think is one of the best game of all time. But makes Dark Souls looks like a casual game.